The design requirements were to keep the rest simple and very user friendly with the controls close together. [Controls don’t poke you in the ribs] This allows you to make both vertical and horizontal adjustments without moving your hand on the rest. Weight is only 22 lbs. (about 10 lbs. lighter than most) but is very stable and doesn’t need a sand bag on it to keep down the vibration. My Hall rest is the only rest where every shot has the same rifle tune as shooting off my two piece sand bag set-up. All metal parts are either aluminum or stainless steel - No rust. All plastic parts are not delrin, but a new plastic which is much tougher and slicker. All wear points and threads can be adjusted for a perfect fit and feel. [Will never wear out] Rifle rides on plastic, not sand bags. [Sand bags are not needed to deaden vibration as with many rests.] Comes with a solid front post. [You can’t forget to lock the front post] Fits both 3 and 2 ¼ inch stocks. Rifle is held down in the front by adjustable spring loaded plunger. Comes with rifle return system. Has travel limits on all adjustments. Hall	Manufacturing was started in 1977 by Allan Hall to build custom actions. Allan has over 25 years experience in designing and building actions. 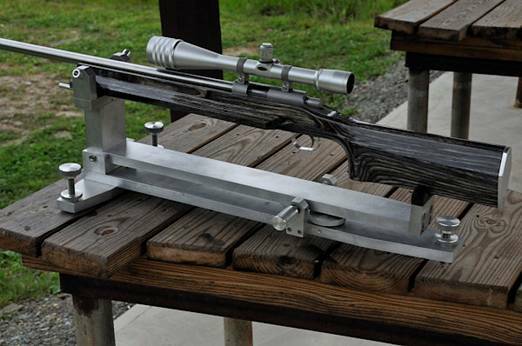 He has also built match barrels, triggers, fit and chambered, and built complete rifles. This	experience has allowed Hall Mfg. to build actions that have won Bench Rest matches at National levels of competition. Copyright © 2017 Hall Mfg.. All Rights Reserved.